How to draw Starcraft Marine. 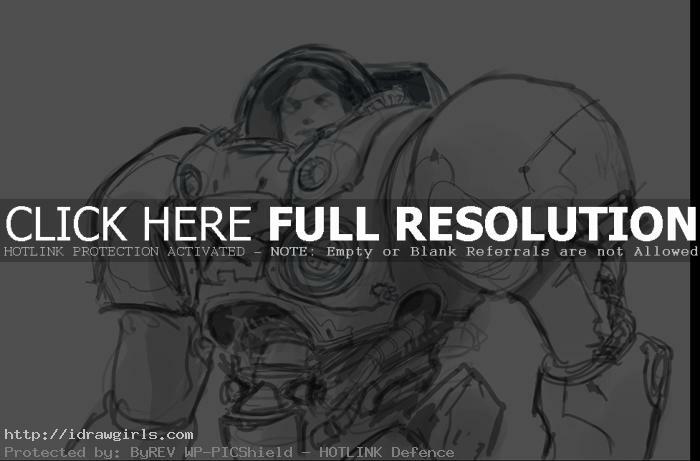 Learn to draw a marine from Starcraft with drawing video tutorial and step by step images. This drawing video tutorial shows you from basic rough sketching to finish drawing quick sketch for concept art quick sketch. The video demonstrates how to quickly create an efficient concept design from concept idea into visual. You can also find step by step tutorial by scrolling down further. You will learn how to easily break down the complex mech armor design into simple shape for your drawing and design practice. Marines compose the bulk of most terran front-line forces, ranging from officially government-sanctioned units and local militias to renegades and mercenaries. Marines are the first line of defense for most terran worlds in the Koprulu sector. In the time of the old Confederacy the vast majority of marines were criminals or rebels who had undergone mandatory neural resocialization. Freed from any previous allegiances or ideologies, these fearless soldiers stood ready to defend Confederate interests with their lives. Here is a final sketch of a Marine from Starcraft. 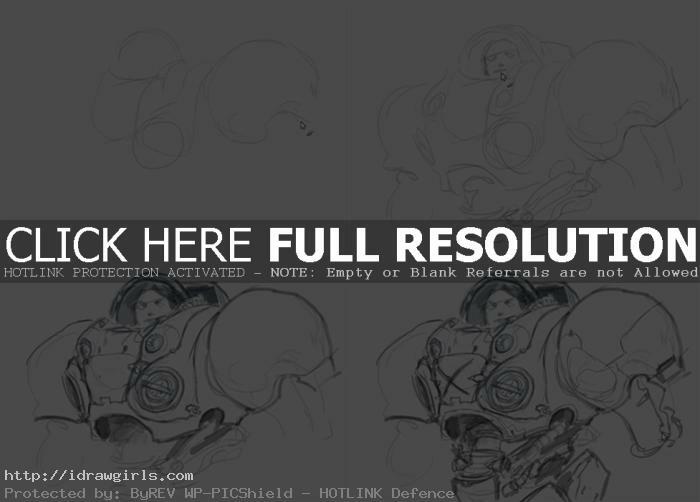 Below are step by step image drawing a female marine from Starcraft video game. Step one, I only use big geometry shape to start of my drawing. Do not put any detail complex design to begin with, get the proportion right first. Step two, at this stage you can see the whole proportion of the marine is correct and I only use big simple shape to put them together. Step three, now I can add detail within the big shape I drew earlier. Step four, then I put more detail to the rest of the armor that I drew. Done!